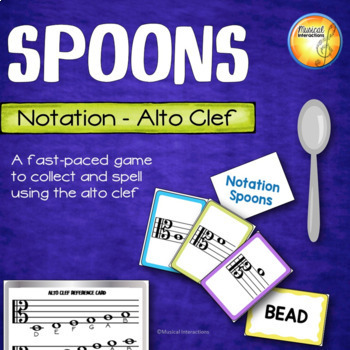 This fast-paced, interactive game is sure to keep students' attention while reviewing alto clef reading. It's a perfect game for music centers and your sub tub! 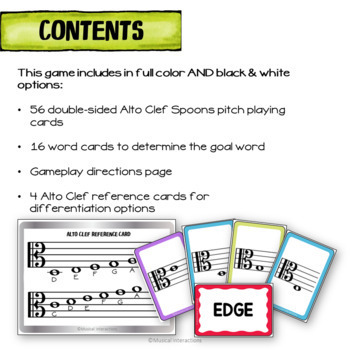 Students will need to collect 4 alto clef cards to spell the goal word in order to grab a spoon and stay in the game! 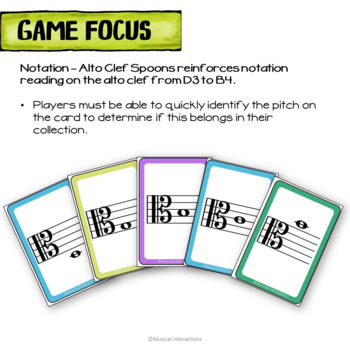 There is a deck of word cards to choose the goal word to spell and a deck of notation cards displaying the staff with alto clef symbol and a whole note on an individual note. The range of pitches go from the D below the staff to the B above the staff. Double-sided cards are available in color and black & white deck options. There are 16 word cards and 52 notation cards. You will need plastic spoons. Game play directions are included. 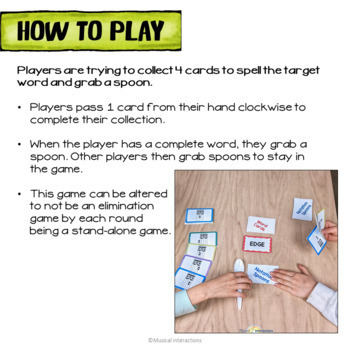 This game can be played alone or mixed together with the treble clef spoons game and bass clef spoons game. If you like this product, please see my other items.